Prevents the formation of bad body odors. 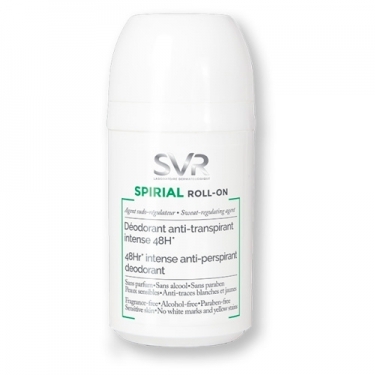 DESCRIPTION: Spirial Deo Roll On Anti-Transpirant from SVR is antiperspirant and deodorant for armpits and feet. Suitable for more sensitive skin. Regulates perspiration and absorbs moisture, both antiperspirant and deodorant, this care leaves the skin with a fresh effect. Dries quickly. Hypoallergenic. It is an intense sudoregulador deodorant of normal or excessive perspiration, it prevents the formation of odors at the level of the armpits, feet, hands, folds and the face. It has an ultra light texture that does not stick, and does not stain. It has a high tolerance formula, without parabens, without perfume, without alcohol, without propylene glycol adapted to a daily use even in sensitive skins. Apply daily under armpits and feet after daily hygiene.